Female hair stylist custom bobblehead doll is dressed in short yellow sleeved t-shirt,blue cropped trousers and a black apron top. She is also holding a comb in one hand and a hair dryer in the next hand. 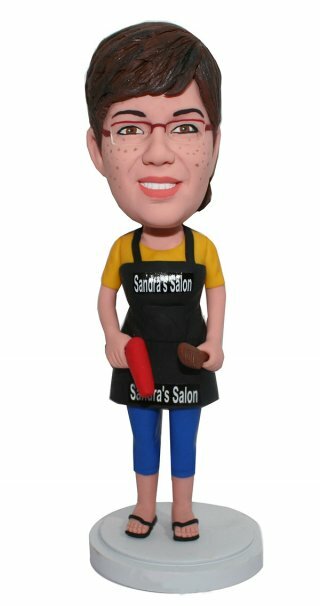 If you would like to send a special bobblehead doll for a hairdresser, just do not made it so simple, writing her name on her apron that belongs her to make it more unique. 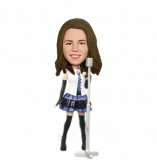 Go and get one, she must be thrilled by how lifelike and cute of this keeping bobbling bobblehead. when you place the order,please leave the message .